The Sheep Whisperer: How much Wood can a Woodchuck Chuck? 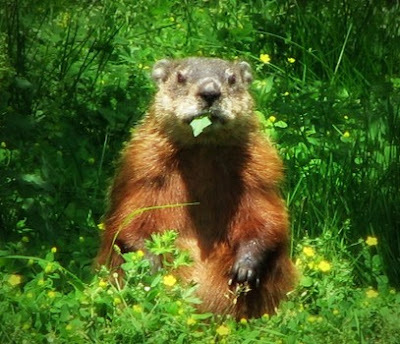 Chuck or "Little Pig" was the name designated for a Woodchuck by our early English settlers when they first encountered the Woodchuck. It was, in their eyes, an appropriate name based on outward appearances. Upon closer examination, nothing could be further from the truth! 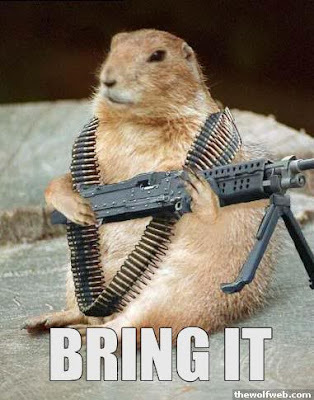 The Woodchuck could be considered an "undercover agent", sporting many aliases, such as groundhog, varmint, house cleaner of the year, earth moving machine, & marmot! Ewe will have to pick which name fits! Call me any name that ewe like, but just don't call me late for a veggie dinner! Fastidious & orderly best describe this rodent, which weighs up to ten lbs. 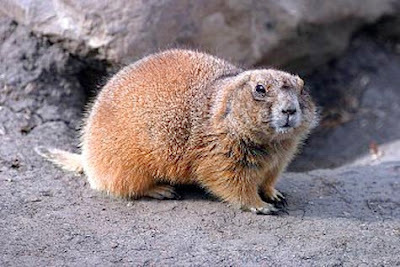 & is a member of the large ground squirrel family called marmots. Equipped with long, powerful claws, woodchucks are able to move massive amounts of dirt in a relatively short period of time. One biologist measured one woodchuck den to contain 700 lbs. of dirt! Now that's "Moving"! Un -be-"leaf"- able! Can't a guy get a little privacy while eating? 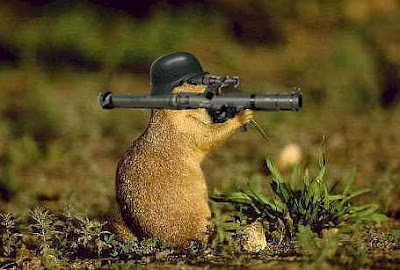 Woodchucks are really a blast, targeting any dirt on their bodies very carefully! They are real "Clean Freaks" when it comes to personal grooming & housekeeping. They even are distinguished in the animal world regarding their elimination of waste called excrement. Woodchucks bury waste in 2-3 inches of dirt, some distance from their den. Then they will use their head to pound the dirt down, to ensure that it will not be disturbed! Licking their paws & removing burrs & dirt from their fur is also a daily ritual! Don't even think about it! Ewe come any closer to my den & it's Hasta La Vista! bobcat, or bear. Woodchucks also communicate with a shrill whistle followed by a "chuck, chuck"! Woodchucks hibernate as well as "forecast" weather in a "shadowy" kind of way! Are Ewe Ready for some of This? Sheep unfortunately are sometimes misjudged by their outward appearance, & don't take the same approach to personal grooming as the woodchuck! Sheep heavily rely upon their Shepherd to examine them for any unnecessary items they may have acquired in their wool. He is the one who ultimately decides whether or not it's time for a haircut or a bath! 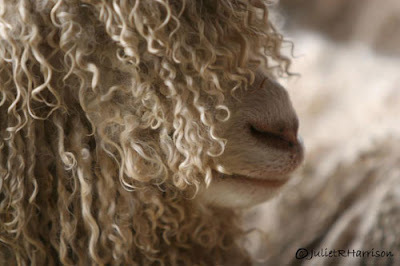 Don't ewe try to pull the wool over my eyes! Has anybody seen my hairdresser? As Ewe think about how the Good Shepherd washes Ewe today with the water of His Word, why not give thanks! His watchful eye is zoomed in on all the minute details of Ewe-r life! Not to fret! 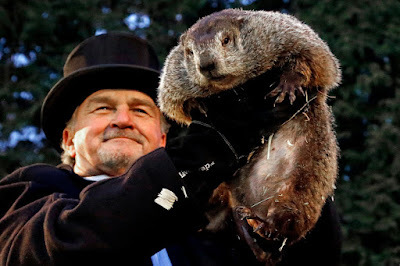 I JUST PREDICTED 6 MORE WEEKS of WINTER! Thank Ewe Georgia for the encouragement! I agree with ewe & I'm thankful that He is doing the clean-up work on each of us! It's best that way since He can see where all the dirt is! God Bless Ewe!& keep commenting!